Barbell Samurai has eight multi purpose racks. Each with it's own bench (six flat, two adjustable), it's own 20kg bar and pair of lockjaw collars, a full set of plates (2x 25kg, 2x 20kg, 2x 15kg, 2x 10kg, 2x 5kh, 2x 2.5kg), and pair of spotting arms. There are also extra specialty bars, currently we have a Swiss Bar with neutral grips, a 15kg "female" Olympic bar, a 32kg Strongman Log, a 3kg teaching bar, a Safety Squat Bar (22kg), a Fat Axle Bar (20kg), a 25kg Trap Bar and a EZ Curl Bar. We are always looking to add more to our range too! There are also two dips bar attachments for the racks. Each pair of racks (front rack and back rack) have a set of incremental plates (2x 0.25kg, 2x 0.5kg, 2x 0.75kg, 2x 1kg), full set of 41" resistance bands, and a weighted dip/chinup belt. There are also four weightlifting belts (S, M, L, XL) on the walls and two chalk bowls for use by any member. 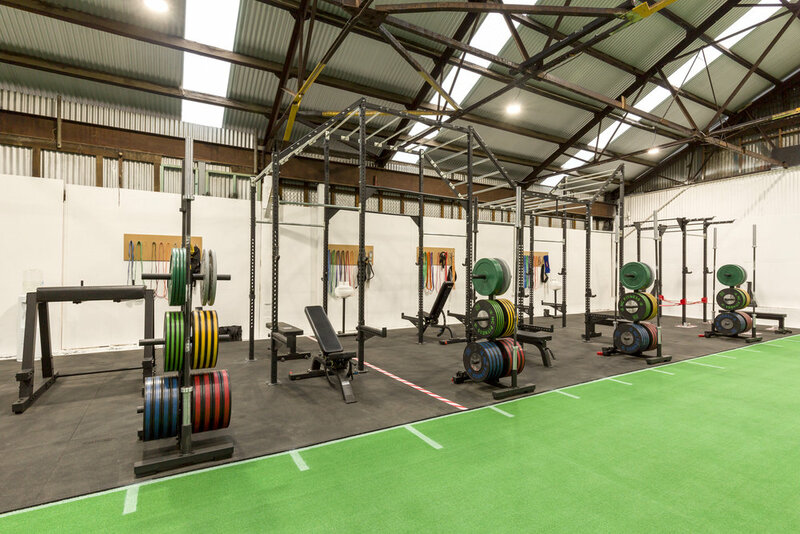 Across the racks there are 16 different chinups bars with 8 different heights, as well as a set of monkey bars that range from approximately 2.6m-3.7m high. One of our racks has attachments for bands at both the floor and above the rack and a second rack has attachments for bands above the rack. This rack also has spotting slings as an option to use instead of safety arms. We have three 15m long ropes (2x 15kg, 1x 24kg), nine pairs of kettle bells (6kg, 8kg, 10kg, 12kg, 14kg, 16kg, 20kg, 24kg, 28kg) and fifteen deadballs (2x 4kg, 2x 6kg, 2x 8kg, 2x 10kg, 2x 12kg, 2x 15kg, 1x 20kg, 1x 25kg, 1x 30kg) that can all be used for a wide variety of exercises in both strength, and conditioning training. There are twenty pairs of dumbbells, 2.5kg up to 50kg in 2.5kg increments. We have a set of jerk boxes (2x 38cm, 2x 30cm, 4x 15cm, 2x 6cm) that are designed to be stacked (2x 104cm towers fully stacked) that are capable of handling any weight that you can, and can be used for a range of activities including but not limited to: deficit or limited range deadlifts, box jumps, step ups, and box squats. We have four sled to choose from. Two Prowler Sleds that can be pushed, pulled with a harness for those wanting to work on their sprint mechanics, or reverse pulled with handles by those wanting to challenge the strength and endurance of their quadriceps, as well as a Pull/Sprint sled for reverse pulls and harness sprint work and a Push Sled that can be used in a similar manner to the Prowler Sleds. There are also Farmers Walk Handles for doing loaded carries to work on their posture and grip strength. There are two cable trainers for use with a variety of exercises. One has a 1:4 ratio for smaller increases and a lighter weight in general, and the other has a 1:2 ratio for a heavier resistance. There is a bench pull with it's own 20kg bar for those wanting to develop their upper back strength, a 45 degree sled leg press and a reverse hyper to build their posterior chain.